Ultra Powerful Enzymes and Proteolytic Probiotics… have an undeniable ability to provide optimal support to our immune system — and make the immune system work as it was designed to. Symptoms such as… eczema, psoriasis, indigestion, diarrhea, constipation, cirrhosis, cancers of all types, hepatitis, colds, flu, fever, bacterial and viral infectios and much more are manifested due to a lack of Enzymes and Probiotics. Supplementing with Enzymes and Probiotics (Friendly Flora) IS MORE IMPORTANT than taking vitamins and minerals! 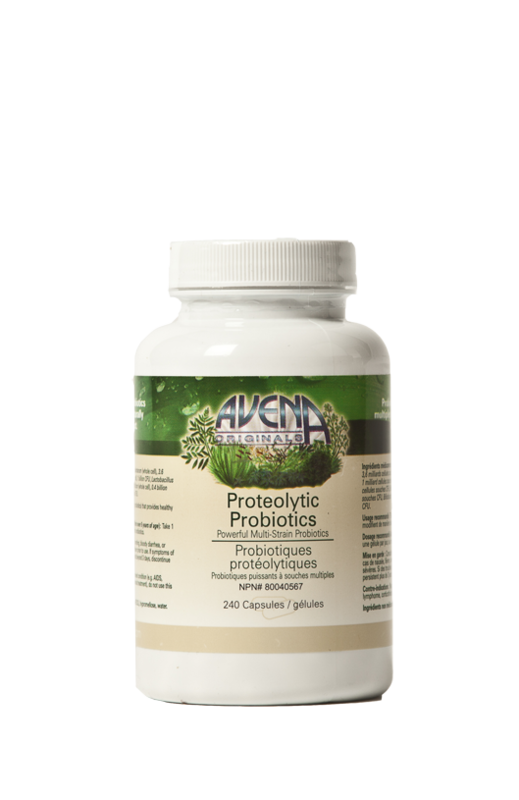 Avena Proteolytic Probiotic L. Acidophilus DDS1 is a patented product. US Patent & Trademark. The patent relates to a biologically pure strain of Lactobacillus Acidophilus which has proteolyic, anti-viral, anti-bacterial, anti-microbial, and anti-tumoral characteristics and uses. What makes the Proteolytic Probiotic special from other supplements with L. Acidophilus? Avena’s L. Acidophilus DDs1 has the ability digest proteins giving it a new world of uses when compared to the standard Lactase (sugar) digesting bacteria’s. Because the Proteolytic Probiotic can digest protein, it can break down and assimilate the impacted matter in your intestinal track, attack Bacteria & Fungi, and even attack and destroy viruses. Now there is something you can do when you get a cold or flu! To look at a step further, Proteolytic Probiotic can break down other abnormal protein structures like tumors. This bacteria is not like any other you have ever used before! Avena Originals – Reclaim Our Health Avena Originals strives to promote health and well-being through fundamental principles. To empower healing by eliminating toxins and enhancing nutrition through world class Electrically Available™ and Formulated Natural Health Products. Audio Recordings: An interview with Michael O’Brien & Toby Watkinson regarding Dr. Bernard Jensen amazing recovery from prostate cancer. The MAIN and MOST IMPORTANT WORKERS of the body are ENZYMES and PROBIOTICS. Imagine building our dream home… we purchase the best quality lumber, nails, concrete, etc… We deliver it to the job site with no workers and watch… as nothing happens without the workers? This is the frequent result of many nutritional programs. They deliver great vitamins, minerals, proteins and fats into their bodies; but forget about the workers, which are the Enzymes and Probiotics. 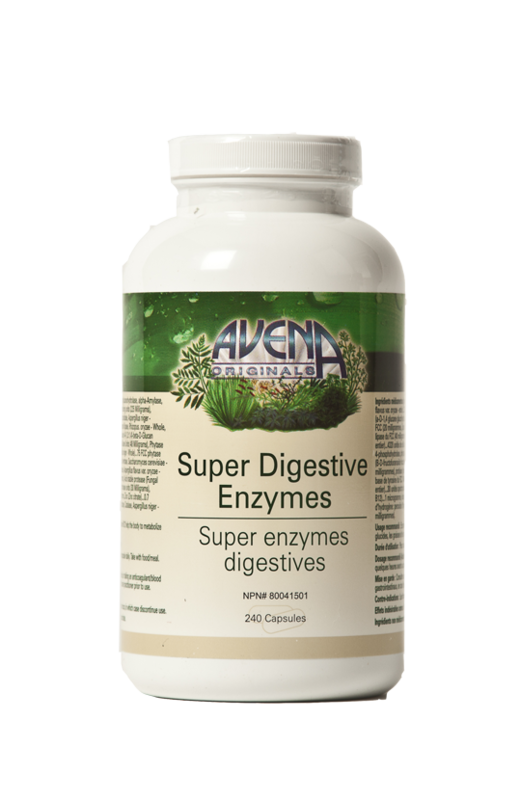 Enzymes are the catalysts that allow the vitamins to be absorbed, the mineral to be delivered and the protein to be digested. Simply put they do the work! And probiotics support the enzymatic action. With both of these products working together, we’ll have the ENTIRE digestive system covered; from the start… break down and digestion in the stomach to the complete finishing of the total process in the intestines. New knowledge and research is continuing to push the boundaries in Natural Health Products. 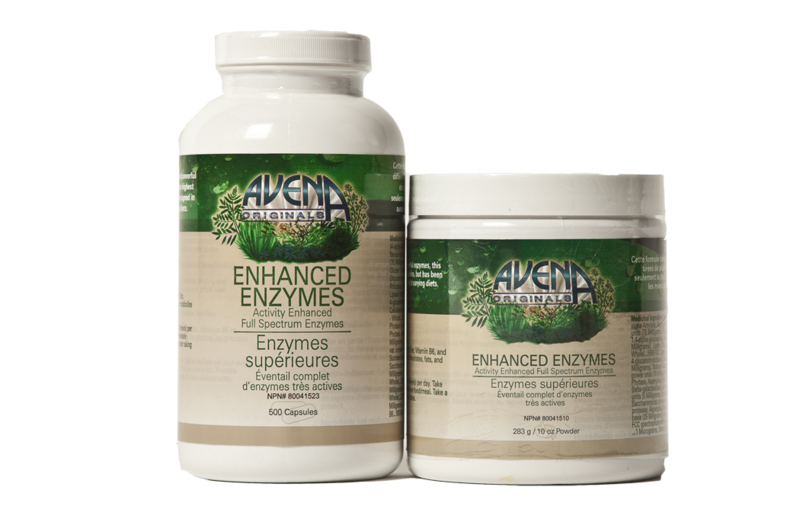 Two categories of areas that Avena Originals has always lead the market in are ENZYMES and PROBIOTICS. Avena Originals took this opportunity to reformulate our key products to EXCEED ACTIVITY LEVELS, DIVERSIFY, CLEAN and EMPOWER these products to NEW levels. You Won’t Believe the Difference… We were considered the BEST in the industry; now we have gone ABOVE and BEYOND! Diversity… We diversified our blend by adding many new and exciting enzymes. 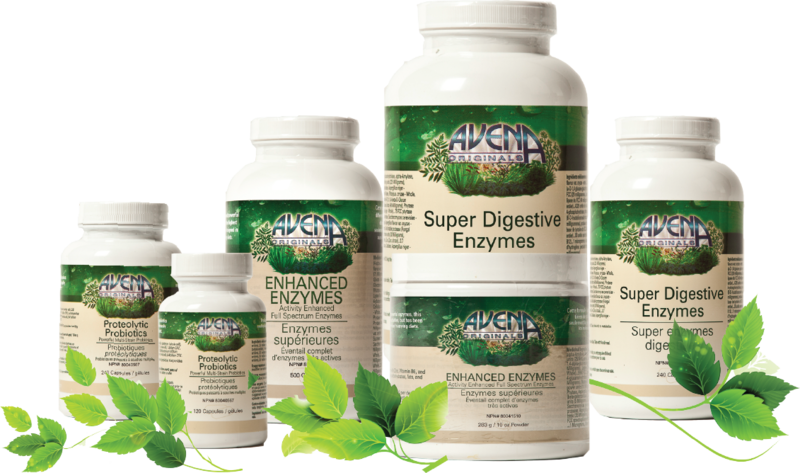 Originally we had 8 enzymes… we now have 12 different enzymes, providing a more powerful and well rounded product. Activity & Potency… By increasing potency in each enzyme we have been able to provide a stronger more impactful enzyme. Imagine a powerful battery. A certain battery may be the best battery, but they have different types, some with more stored energy than others. Enzymes work the same way. We have increased the potential energy of each enzyme. The potential now is 2 times and in some cases 3 times more energy per enzyme! The rice bran and the beet fiber have been removed, providing higher enzyme levels in each variety. Diversity… One enzyme does not fit all needs. This formulation has been designed like the previous battery… increased potential energy of each enzyme. We are now getting 5 times and in some cases 6 times more energy per enzyme! L. Plantarium OM is a bacteria strain that exceeds all expectations in the normal realm of Probiotics. · Anti- Viral… Mice were inoculated with the Rauscher Leukemia Virus (RLV) and then fed L.Plantarium OM as both pre and post inoculation treatments. Using spleen weight as a primary indicator of viral effect, mice were sacrificed at 4 weeks after inoculation and spleen weights were compared. The group of mice pre-treated with L.Plantarium exhibited only a 10% increase in spleen weight as compared to a 3,620% increase in the spleen weight of the mice left untreated. · Anti-Retro Viral… Since the RL virus is a known example of an animal retro-virus, L.Plantarium also exhibits exceptional anti-retro-viral activity. It can also be used to screen other pharmaceutical agents for anti-retro-viral activity. **Most other probiotics have to be refrigerated and they also have a short shelf life. In a stomach acid environment, over 80% might be destroyed and deliver perhaps less than 10%. Many are kept on the shelf for a very long time, perhaps up to a year. With a poor shelf life survival rate, only 30% might only be active. Therefore, many store shelf probiotics could be dead probiotics. A 20 billion CFU count might only deliver 10% or 2 billion CFU. To summarize… these hard working Friendly Bacteria and the powerful Enzymes produce substances that create an ‘Electrical Matrix’ to help inhibit cancers, viruses, reduce cholesterol, enhance the immune system and help distribute protein, minerals and vitamins to every organ in the body. Even symptoms of ADD, Parkinsons and other illnesses would benefit from Enzymes, Probiotics and Whole Food Supplements plus a change in our lifestyle and good nutrition. Re-populating the intestinal tract with natural friendly bacteria in a formulation that is ‘Electrically Harmonious’ is of paramount importance to health and vitality. Call: 1(250)220-1262 LeadingEdgeHealth@shaw.ca Help yourself and help others attain ideal health and BE HIGHLY REWARDED! This entry was posted in Cancer Truth, Enzymes, Immune system requirement, Proteyolitic Probiotics. Bookmark the permalink. How do I order super enzymes?